STUART, Fla. – May 2, 2018 -- The American Cancer Society today announced Seacoast Banking Corporation (“Seacoast”) (NASDAQ: SBCF) as a regional sponsor supporting Making Strides Against Breast Cancer walks in eight communities in Florida. 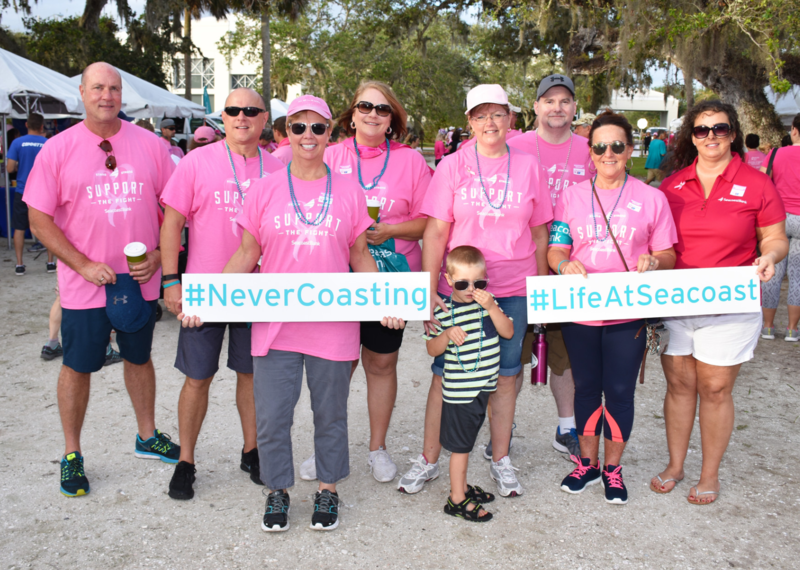 Seacoast Bank will now be the Pink Premier Presenting Sponsor -- the highest level partner for four communities – in Indian River County, St. Lucie County, Martin County and north Palm Beach County. The partnership includes additional premium sponsorships for Brevard and Volusia counties, as well as its events in Orlando and Tampa, all scheduled for October of this year. Woodson observed that Seacoast Bank’s commitment is unique in that its associates and executives alike engage in team fundraising and walking alongside customers and neighbors who are breast cancer survivors. As regional sponsor, Seacoast’s combined fundraising efforts and sponsorship dollars have increased from about $20,000 in 2017 to more than $150,000 this year. As part of Seacoast’s sponsorship, American Cancer Society is bringing in the Big Pink Chair for Making Strides events in Martin, St. Lucie, Indian River, Palm Beach, Volusia and Brevard counties as well as Orlando. The oversized pink photo prop is new to the Making Strides events in Florida and has brought an additional element of fun to the events. To join the Seacoast Bank and the American Cancer Society at a Making Strides Against Breast Cancer walk, visit www.makingstrides.org. Seacoast Banking Corporation of Florida is one of the largest community banks headquartered in Florida with approximately $5.8 billion in assets and $4.6 billion in deposits as of December 31, 2017. The company provides integrated financial services including commercial and retail banking, wealth management, and mortgage services to customers through advanced banking solutions, 49 traditional branches of its locally branded wholly owned subsidiary bank, Seacoast Bank, and seven commercial banking centers. Offices stretch from Fort Lauderdale, Boca Raton and West Palm Beach north through the Daytona Beach area, into Orlando and Central Florida and the adjacent Tampa market, and west to Okeechobee and surrounding counties. More information about the company is available at SeacoastBanking.com. The American Cancer Society is a global grassroots force of volunteers saving lives and fighting for every birthday threatened by every cancer in every community. The American Cancer Society's efforts have contributed to a 38 percent decline in the breast cancer death rates in the United States over the past two decades. According to the American Cancer Society Cancer Facts & Figures 2017, an estimated 252,710 women in the United States will be diagnosed with breast cancer and 40,610 will die from the disease this year. About 2,470 men are also expected to be diagnosed with breast cancer this year with 460 deaths. The American Cancer Society Making Strides Against Breast Cancer walks are the largest network of breast cancer awareness events in the nation. Since 1993, more than 13 million supporters have raised more than $810 million nationwide to help save lives from breast cancer. The dollars raised enable the Society to fund groundbreaking breast cancer research; provide free, comprehensive information and support to those touched by the disease; and help people take steps to reduce their breast cancer risk or find it early when it’s most treatable. We're finding cures as the nation's largest private, not-for-profit investor in cancer research, ensuring people facing cancer have the help they need and continuing the fight for access to quality health care, lifesaving screenings, clean air and more. For more information, to get help, or to join the fight, call us anytime, day or night, at (800) 227-2345 or visit cancer.org.